Preheat the oven to 425°. In a mini food processor, pulse the sage, rosemary and thyme until finely chopped. Add the lemon zest and pulse to blend. Add the salt and pulse until finely ground. Transfer the herb salt to a small bowl. In a large bowl, toss the potatoes with the oil and butter and season with pepper. 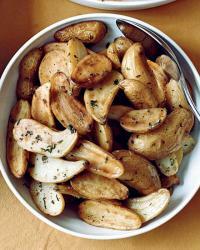 Spread the potatoes in a single layer on 2 large rimmed baking sheets and roast for 25 minutes. Season the potatoes generously with the herb salt, toss well and continue baking for 5 minutes, or until the potatoes are tender and golden. Transfer to a bowl and serve hot or warm.